Or do I slit the laces? It is Sunday night, and I need to make a decision and live with the consequences. My employer has put into play a series of cost-containment policy changes: less pay, no more bonuses (ever), smaller staff (read: more work for those who remain), and austerity measures on general money spending. In some cases, a leaner organization emerges from such policies and the resulting financial success pays huge dividends to those who stick it out. On the other hand, they are offering a generous severance package to those who opt to leave voluntarily. Leave, and become unemployed in the worst financial crisis of the last seven decades (so far). 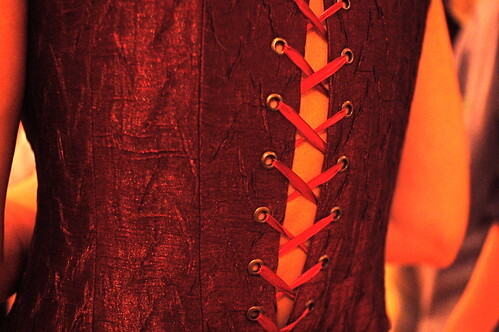 Like this corset the choices are not always obvious. Do I stay in the restricted environment - contained and supported, perhaps even comfortable? Or do I slit the laces, exhale and be unrestrained - and unsupported? Both options have pros and cons, and there are a pair of us affected by the decision. I will be provided with money for 18 months of Cobra as part of the severance. Beyond that I am on my own. Reena will be looking at what is availble through AARP (!) programs.